Distances in Venice are short, so--in theory--location shouldn't be as crucial as it might be in a city like Rome or Milan. In practice, location does matter, especially if you're traveling with heavy luggage and don't want to spend a lot of time and money on transportation. The area around the Piazza San Marco is convenient to the major sights, and you can reach it easily with the Alilaguna Blue Line airport boat. But it's also the most popular tourist area in Venice, with higher prices and bigger crowds than other sestieri or neighborhoods. Hotels near the Piazzale Roma are convenient if you're arriving by airport bus, land taxi, or the People Mover automated tram from the Tronchetto parking garage and the Marittima cruise terminals. Hotels close to the Santa Lucia Railroad Station are convenient for train travelers, although the pedestrian routes between this area and San Marco can be jammed with day-trippers in the summer and on holiday weekends. Dorsoduro and San Polo, on the less touristed side of the Grand Canal, are good bets during high season. Cannaregio also has a neighborhood feel once you get away from the busiest streets. 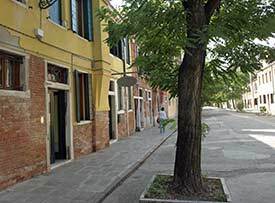 Closer to San Marco, the Castello district has some quiet areas not far from the main tourist attractions. The Lido, an island that separates the Venetian lagoon from the Adriatic Sea, is popular in summer--especially with well-heeled beach buffs and golfers who can afford the tabs at classic resort hotels like the Excelsior Palace. From the Lido Santa Maria Elisabetta vaporetto stop at one end of the island's main street, public water buses offer frequent service to the Piazza San Marco and other locations in Venice's historic center. Finally, you can save quite a bit of money by staying on the Venetian mainland. Mestre, Venice's modern suburb, is especially convenient if you have a car and don't want to pay Venice's high parking rates. For hotel recommendations, see our Mestre (Mainland) Hotels page. Note: We recommend booking a room in Venice's historic center if you can. During high season and on weekends, the tourist population shrinks dramatically after the daytrippers have gone home. This makes late evening and early morning the best times to enjoy Venice without the crowds. The typical Venetian hotel is a former casa or palazzo with a limited number of rooms. This fact, combined with the great popularity of Venice, means that room shortages can occur at any time from spring through fall. Our best advice is "Book ahead." If you do show up in Venice without a confirmed room, try the hotel reservations office in the train station, the parking garage at the Piazzale Roma, or the Venice Autostrada terminus on the mainland. But be prepared to stand in a long line, and the available hotels may be inconvenient to reach (especially with luggage). For places to stay, see the menu below.